As M moves further into toddlerhood, we’ve been starting to think about the ‘bigger’ toys that she might need and the skills that she needs to develop next. Matthew loves cycling to work and getting out for a quick ride on his road bike. M has seen this and expressed an interest in cycling from an early age. Obviously, we want her to learn to ride a bike, but we weren’t sure whether to start with a balance bike, or a bike with stabilisers. Balance bikes weren’t really a thing when I was a child. I think they’re a great idea, though, as they enable the child to get a feel for their centre of gravity, without the fear of falling over. 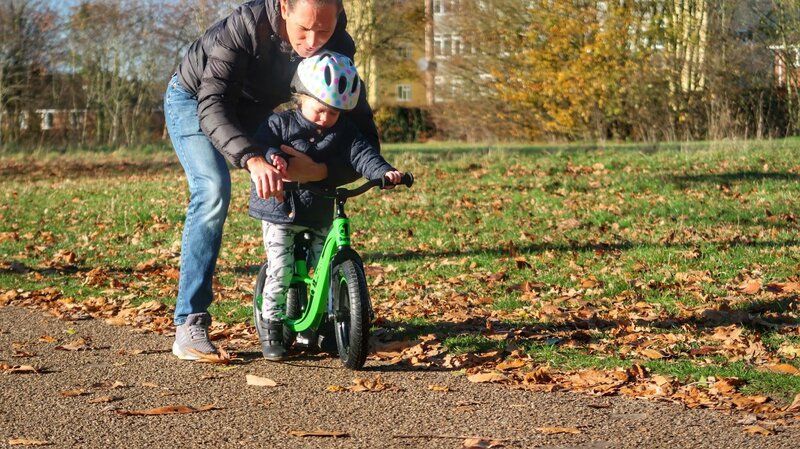 Buster Bikes kindly sent us their new Buster #1 balance bike to review, so we thought we’d take it down to the park and give it a go! If you’re not familiar with balance bikes, they are pedal-free bikes, which the child sits on and propels themselves with their feet. M was really excited by her neon green Buster #1, and hopped about impatiently while we assembled it. The bike comes in three parts; you just have to fit the seat and the handlebars into the frame, using the tools provided. As soon as we had the bike together, M set about trying to ride it up and down the kitchen. A promising start! Obviously our kitchen isn’t the ideal bike-riding location, so we took the Buster #1 along to our nearest park for a proper ride. We’re very lucky to have such a beautiful park with wide, paved paths to cycle on. Unfortunately, M reverted to her usual scaredy-cat self and was too scared to ride the bike along the path by herself. Matthew helped her out and held her steady, but she still wasn’t keen. 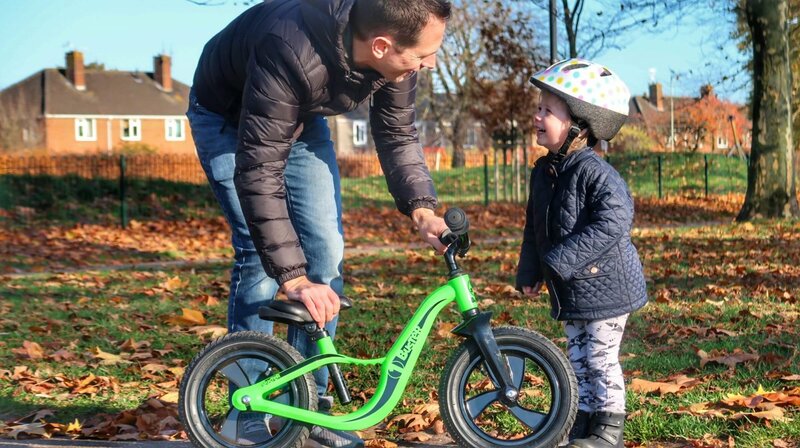 I think the main issue is that M is on the short side, so although the bike is suitable for 2-5 year olds, M is still a little small for the frame, despite being two and a half. She is able to sit on the seat with her toes touching the floor, but as she’s yet to find her balance, I think she needs her feet to be flatter on the ground to get started. M will grow, and I’m sure in time she’ll be whizzing along on her balance bike! She’s a funny old stick and takes a bit of time to warm up to things, so I’m sure in time she’ll grow to love it. Despite being a bit wary of actually riding it, M loves her new balance bike. She proudly showed it off to grandma last week, explaining, “it’s a balance bike because it doesn’t have any pedals.” She’s also been pointing out other bikes and identifying them as balance bikes or otherwise! I can see why she likes it. The Buster #1 is sturdy and well made, and has a handy carry grip moulded into the frame, which I discovered when carrying it back through the park. It’s little details like that, which you never knew you needed, but actually make life so much easier. The seat post and handlebars are adjustable, so the bike will grow with M as she (eventually!) grows. While we were at the park, we saw a number of other children on balance bikes, and I must admit I did smugly think that ours was the nicest! The plump, air filled tyres seem really sturdy and add to the high quality feel of the bike. 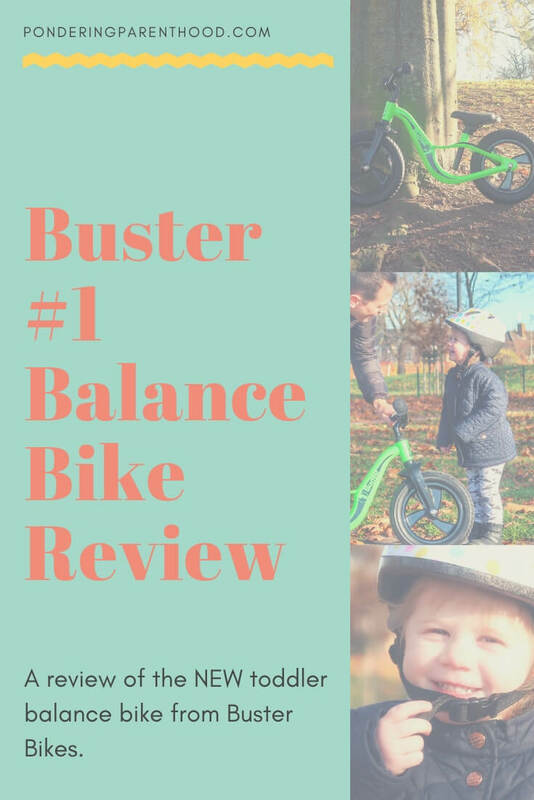 Overall, I think the Buster #1 is an attractive option if you’re looking for a balance bike for your toddler. It’s well made, easy to assemble and looks cool. The frame is smooth and light, which makes it easy for small people to operate. An ideal first bike for any budding cyclist! 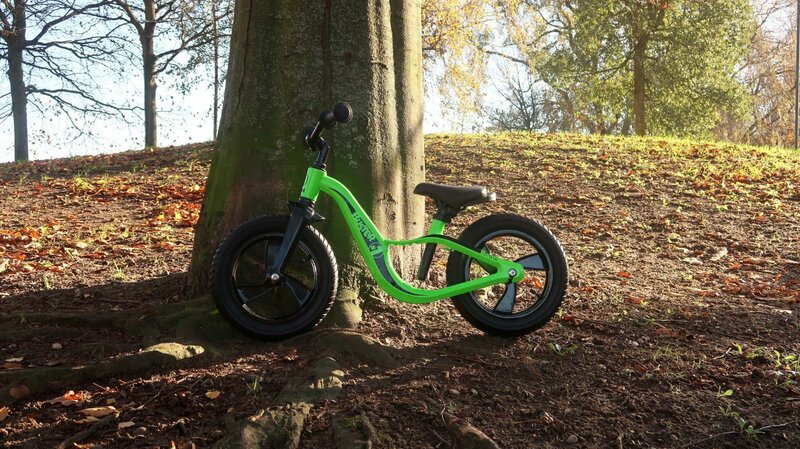 The Buster #1 balance bike retails at £89. Disclosure: We were sent the above products for the purpose of this review and compensated for our time however all opinions are my own. We’ve been looking at getting a balance bike for Piglet. 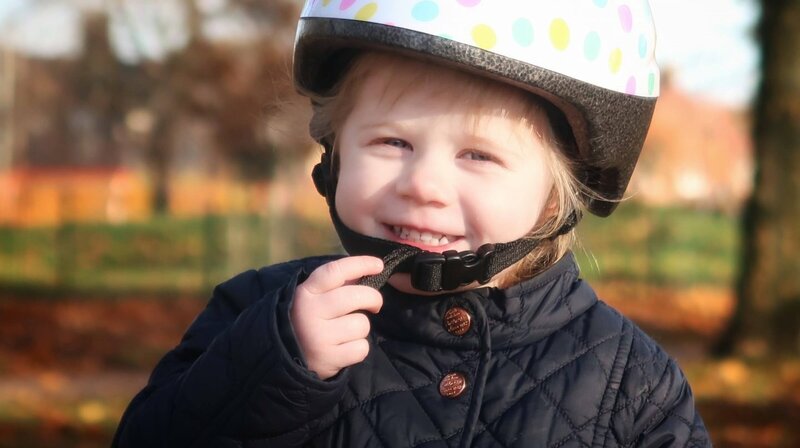 She loved watching her older siblings on their bikes over the summer, would be lovely for her to join in the fun. I think she’d love this! I think once M grows a bit more she will love it too. She keeps pushing it around the kitchen. Hopefully in the Spring she’ll be a little taller and more keen to ride it. I think it’s a really thoughtfully designed bike.